Thematic maps: I liked the use of thematic maps to show the general locations of the countries. Just plotting things on the background data of GEarth can be difficult to understand because the imagery is visually 'busy'. Professional Audio: The audio to go with the tour was good quality and professionally done. No Introductory Logo: As Frank pointed out to me recently, an introductory screen logo helps viewers focus on what they're about to get and who is telling them the story. That being said, they do get their logo in at the end. Ground instead of Screen Overlay: Although I liked the overview thematic maps, the authors used a screen overlay rather than locating the map on the ground as a ground overlay. This would have been better as features in GEarth would have been related to the boundaries of the map. Areas not Points: At one point the tour refers to 'Helmand province' but we aren't shown the boundary to this area on screen we just see Helmand city as a point, a province is clearly an area not a point. More detail on the general point of polygons vs placemarks in Google Earth in my Google Tech talk. 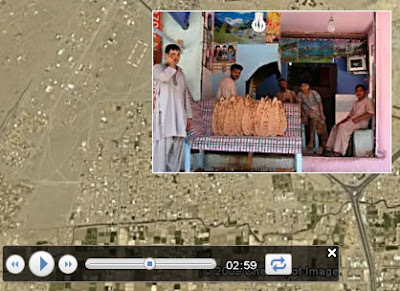 An excellent audio image slideshow from the UK Guardian, also about Afghanistan. My tour about global warming in the Himalayas which has examples of intro logos, mountain fly throughs, ground overlays and polygons. I've contacted CBC to see if they had any comments on this review, I didn't hear anything from them. I've been trying to get greater control of the screen overlay fade in/out technique but the few tours I've found that do this are all embedded in the plug-in. I'd like to get my hands on some actual code. Any suggestions?